Puck Pentenga looks upfield. 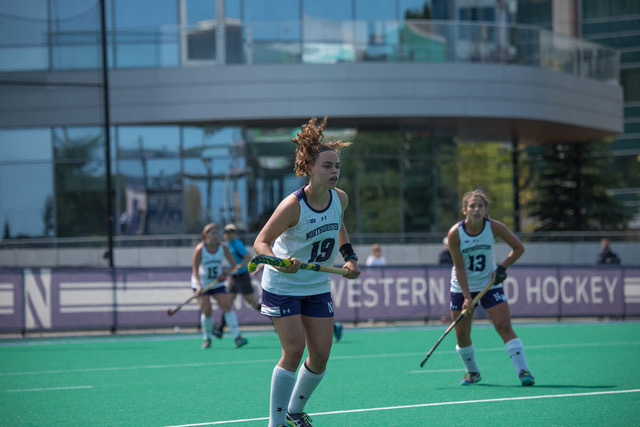 The junior midfielder tallied two assists in each of Northwestern’s wins over the weekend. After a rough nonconference season, No. 14 Northwestern needed a confidence boost ahead of its Big Ten opener. The Wildcats (4-3) overwhelmed Temple on Friday night and then beat Kent State on Sunday in their first games at Lakeside Field this season. With the win on Friday, NU snapped a two-game losing streak. The Cats got started early against the Owls (1-4) when sophomore forward Saar de Breij deflected a Puck Pentenga shot into the back of the net just 1:58 into the game. After Pentenga added a goal of her own, de Breij netted her second goal in the 21st minute to give the hosts a 3-0 advantage. NU continued to dominate the rest of the day, with goals from eight different players en route to a 9-1 victory. Pentenga tallied two assists and sophomore goalkeeper Annie Kalfas played the first half and earned the win. In the second half, freshmen Kaitlin Wood, Mackenzie Keegan and Whitney Williamson all scored their first career goals. Sophomore midfielder Erica Hootstein also scored her first career goal. On Sunday, the Cats had a much more competitive matchup against the Golden Flashes (2-5). NU fell behind early when Ines Delpech put Kent State ahead in the fourth minute, but the Cats fought back. For the second straight game, de Breij deflected Pentenga’s shot for NU’s first goal. Just two minutes later, junior forward Pascale Massey deflected another shot from Pentenga to give the Cats a 2-1 lead. The Golden Flashes managed just four shots for the whole game and the result held, giving NU a hard-fought victory. The Cats will now turn to their conference schedule, and they’ll kick off their Big Ten slate when Ohio State storms into Evanston on Friday night.